All classes have a Minimum requirement of 5 students and a Maximum of 10-15 students! 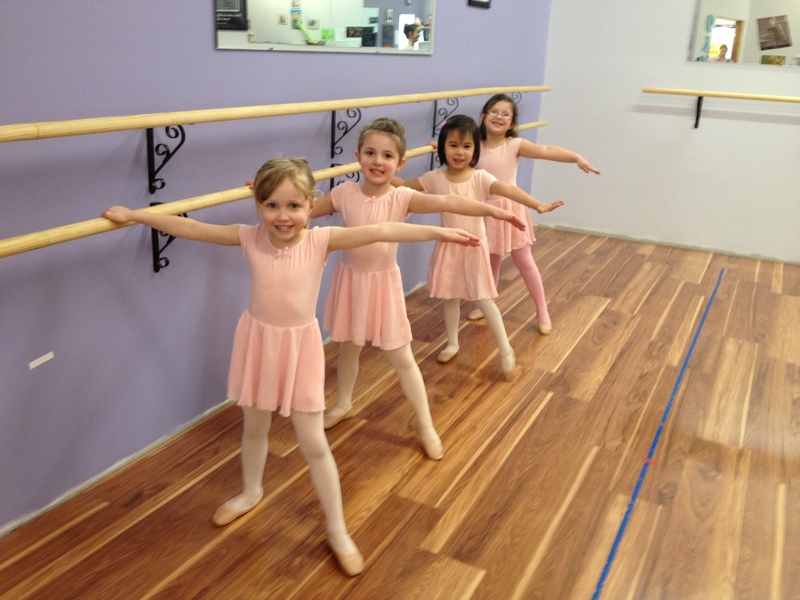 *Please note that our ballet levels include age ranges that span 2 or more years. We use a child’s age as a range but feel it’s more important to place them according to their level/ability. A child will remain in each level for a minimum of 2-3 years before moving on to ensure that they have gained the right amount of knowledge and strength. This is for the child’s safety as pushing technique before they are strong enough can lead to permanent injury. Pre-ballet and basic ballet theory begins to be taught! Ballet theory and terminology are further developed as we introduce and start working in turnout on and off the barre. Beginner teens with little to no previous ballet experience will be placed here temporarily until basic ballet fundamentals are developed and strengthened. This class will be fast paced and is geared towards the more serious ballerina. For beginner pointe dancers with extensive ballet knowledge and ability who have completed our pre-point program and has instructor approval to go up onto pointe. Teacher approval is required before enrolling in this class. Students must be enrolled in a regular weekly ballet class as well as one additional class of their choosing. Students will focus on learning a repertoire of dances to use for ministering in Outreach dance as well as be expected to participate in a weekly Bible Study. All new students(over the age of 8) will need to talk to Miss Erin prior to registering, regardless of previous experience, to complete enrollment. *Please note that our tap levels include age ranges that span 2 or more years. We use a child’s age as a range but feel it’s more important to place them according to their level/ability. A child will remain in each level for 2-3 years before moving on to ensure that they have gained the right amount of knowledge and strength. This is for the child’s safety as pushing technique before they are strong enough can lead to permanent injury. All new students (over the age of 8) will need to take a placement class, regardless of previous experience, to complete enrollment. *Please note that our jazz levels include age ranges that span 3 or more years. We use a child’s age as a range but feel it’s more important to place them according to their level/ability. A child will remain in each level for 2-3 years before moving on to ensure that they have gained the right amount of knowledge and strength. This is for the child’s safety as pushing technique before they are strong enough can lead to permanent injury. ACROBATIC DANCE CLASSES: NEW starting in 2018!!! **Dancers are REQUIRED to also be enrolled in a weekly ballet class in order to take Acro! Dancers must pass ALL required skills in the Primary through level 1 Acrobatic Arts certified curriculum to register for Acro II. Dancers must pass ALL required skills in the level 2 of the Acrobatic Arts curriculum to register for Acro III. Please note that ALL dancers (no matter their age) will start in Acro I. Once a dancer has mastered and tested in ALL required skills for both the Primary and level 1 Acrobatic Arts certified curriculum, they will be permitted to enroll in Acro II. Acrobatic Dance combines the artistic motion of dance and the athleticism of acrobatics. AcroDance is NOT the same as gymnastics. An AcroDancer must complete all of the skills on the hard stage without the advantage of a sprung floor while seamlessly integrating musicality, emotional expression, extension, control and line. The sprung floor allows the gymnast to complete much more difficult tumbling when compared to what is recommended in AcroDance. Skills taught in AcroDance might look the same as gymnastics, but they are taught differently to compensate for the conditions. Neither the ‘AcroDance’ way or the ‘Gymnastics’ way are wrong, but they are different. Here at Leaps of Faith, we use Acrobatic Arts Certified Curriculum and all of our AcroDance instructors are certified and trained through Acrobatic Arts. Their curriculum uses thoughtful progressions to introduce new skills as the dancer has trained his/her body for the skill and is ready for it. This greatly reduces the potential for injury, creates more technically correct work, and helps dancers to progress more quickly (in the long run). Must also be enrolled in a regular weekly Ballet or Jazz/Hip-Hop class to enroll in the Jumps, Turns & Stretch class. This class will be geared for multiple ability levels. Must be enrolled in at least one regular weekly ballet class. Must have had at least 2 consecutive years of ballet technique training. Each class will include ballet barre and center exercises specific for strengthening feet, ankles, legs and core to improve balance and ballet technique to help students properly prepare for Pointe Shoes. Once a student demonstrates adequate strength and preparedness required by their instructor, the purchase of Pointe Shoes will be allowed. DO NOT PURCHASE POINTE SHOES WITHOUT INSTRUCTOR APPROVAL!!! All first time Pointe Shoe purchases should be done at a dancewear store and be fitted by a trained professional. Enrolling in this class will not automatically mean you will be allowed on Pointe. Every dancer’s body is different and might require more or less time than other class mates. Some students may require taking this class for multiple years before their body is ready. Going up on Pointe before a dancer is adequately ready could damage a dancer’s feet/ankles and cause long term health issues. An extensive knowledge and control of ballet technique is also a must to go up onto pointe! Must also be enrolled in Glorify Ballet or Exalt ballet. An extensive knowledge and continued demonstration of proper ballet technique is a must! Must also be enrolled in Exalt Ballet. This class is for the more serious ballerina wishing to further pursue her ballet training. An extensive knowledge and continued demonstration of proper ballet and pointe technique is a must! All dancers must also be fully potty trained and must be able to responsibly conduct themselves within a classroom environment. Within a few weeks of classes beginning, your child should be able to enter the room without crying and participate to the best of their ability for the entire half hour (not lying down, crying, responding to correction, etc.). If we find that your child is not ready, you will need to wait and try again next year. Current month’s tuition and fees will be refunded. If class is cancelled due to bad weather, we will put a notice on our Parents Page by 1pm on weekdays (Under FYI Menu) as well as on our Facebook status. If Lancaster Schools close due to dangerous driving conditions, any morning classes or private lessons will automatically be cancelled as well. If schools cancel for other reasons, please check our website or call to see what we’re up to. We do not necessarily cancel afternoon/evening classes if schools are closed, since the roads are often clear by the afternoon when most of our classes begin, so please call or log on if in doubt. If snow is excessive in your area and you feel that it is unsafe to travel, please don’t! Cancelled classes are not rescheduled unless there have been 3 or more cancelled classes for the season. Please arrive at least 5 minutes prior to the start of class. Dancers entering late are a major distraction to the teacher and the entire class. Our instructors have the right to ask a child to sit out of certain exercises if they are not properly warmed up due to a late arrival. This is for their safety. *Also note that the studio DOES NOT OPEN till 15 minutes prior to the first class of each night. Please DO NOT drop your student off at the door and drive away without checking to see if they have made it into the building. Although our studio is located in a safe area, we are not responsible for children left unattended. If your child misses two classes in a row, a private lesson may be required. ALL CLASSES MISSED IN MAY MUST BE MADE UP! Private lessons should be taken before your child’s next scheduled class. Please call Miss Erin to schedule at (614) 406-2367. These lessons will be given by our student teachers and are $35/half hour. All checks for private lessons are to be made out to Leaps of Faith.